When I heard that today’s ingredient for the Food Network’s #FallFest was pumpkin, I immediately thought of my wonderful pumpkin bread. It always wins rave reviews and is one of the most popular recipes on the blog. But that would be too easy and I wanted to stretch my culinary creativity. What could I put together that would showcase pumpkin in a different way? Taking a hint from my many delightful meals at Middle Eastern restaurants, I decided to create a savory pumpkin dish utilizing many of the spices found in their traditional recipes. And I came up with a winner!! Most people turn up their noses when I mention savory pumpkin dishes, thinking that it can only be used in sweet preparations. But just like butternut squash or other winter squashes are often served savory, we just need to open our minds to a new way of approaching some ingredients. This is a wonderful new way of including pumpkin in your holiday menus, but don’t limit it just to the holidays. It is so good that it would make a fantastic addition to any meal all year long. This version of hummus uses a lot of seasonings that really make it special. And while the ingredient list may seem long, all of them are fairly common and can be used in a many savory and sweet recipes. I use all of these seasonings regularly and you will too once you discover how delicious they are! Have you heard of Dukkah yet? It is an Egyptian seasoning blend that is one of my favorite new discoveries. I got mine at Spice Ace. If you live in the San Francisco Bay Area, check out the Fillmore District shop. They have over 300 spices, herbs, sugars, salts, peppers and blends that you can try before you buy. Just walk in and their talented staff will help you find the perfect seasoning to create a masterpiece! And if you aren’t in the area, you can order any of their products online. I hosted a really fun event at Spice Ace for the San Francisco Professional Food Society (SFPFS). We all had a wonderful time, sampling unique and exciting seasonings, sipping on beautiful California wines and making new friends. If you want to stay on top of what is going on in the food industry in the Bay Area, build amazing relationships and have access to incredible resources, you should join us! If you want to make this with fresh pumpkins or other squashes, go right ahead. I am fighting a cold and didn’t have the energy or inclination to make this with fresh pumpkin. Besides, canned pumpkin is one of the few ingredients that I think is just as good as from scratch and a whole heck of a lot easier! If you are serving this to gluten-intolerant friends or folks with Celiac disease, having some crunchy crackers for them to enjoy will be something they will really appreciate. My favorites are called Nut Thins from Blue Diamond. They have a bunch of flavors to choose from and I’m pretty much addicted to them all, but the Artisan Sesame crackers really complement the flavors of the hummus. With the flavor of pumpkin and glorious golden color, this will be making an appearance at my Thanksgiving feast this year. If you are hosting people with gluten or dairy restrictions, vegetarians or vegans, this is the perfect dish for you! It makes a lovely appetizer, staving off the hunger of your guests as they wait for the turkey without filling them up so much that they can’t enjoy the rest of the meal. Make sure you check out all the other incredible pumpkin recipes listed below and see the beautiful photos on our Pinterest page. Make this a day or two in advance and store, covered, in the refrigerator. The flavors will bloom and meld together and that is one less dish you have to make on the day of your party, Thanksgiving or other event. Libby’s pure pumpkin is gluten-free. Make sure the beans you are using do not contain any gluten ingredients and use gluten-free tamari or soy sauce. Purchase seeds at the grocery store or scrape them out of a pumpkin, rinse and pat dry. If using fresh, let sit out at room temperature for a day or two to thoroughly dry out. Preheat the oven to 350°F. Place pumpkin seeds on a foil-lined baking sheet and sprinkle with olive oil. Toss to coat evenly. With your hand held high for the most even disbursements, sprinkle the oil-coated seeds with the salt and Dukkah seasoning. Place in the oven and toast until lightly golden and fragrant, about 8 to 10 minutes, removing them from the oven halfway through and stirring so they brown evenly. Prepare the Hummus: In the bowl of a food processor fitted with the steel blade, combine the beans, garlic, shallots and olive oil. Pulse several times to break up the beans and then blend until smooth and evenly pureed. Add the pumpkin, all the spices, chiles, tamari, and lemon juice. Process until everything is combined and the texture is silky and creamy. I like mine fairly thick, but if you like it a little thinner add more olive oil, 1 tbsp at a time, blending each time until you get the consistency you prefer. Take a taste and add salt and pepper to your liking. Feel free to add more of any of the spices or chiles if you like your foods with more “punch”. But remember that the chilies will get hotter as it sits, so start with the lower amounts and increase to your individual tastes. Assemble the Dish: Transfer the mixture to a serving bowl, swirling the top with a spoon to create an interesting pattern. Grind a little fresh black pepper over the top. Sprinkle with some of the toasted pumpkin seeds if desired (see Kitchen Skill above for directions on how to toast them). If making ahead, cover and refrigerate up to several days. Serve at room temperature with crackers, baguette slices, as part of a crudité vegetable platter, or other items for dipping. Offer gluten-free crackers if your diet requires it. I have all the ingredients at the ready. I am trying to hold off on actually making it for a day or two because even regular hummus doesn’t last long around these parts! but I am getting anxious. You are going to love this Karen! I thought of you as I was making it, wishing you were in the kitchen with me as it came together and the flavors bloomed! A Winner indeed, Jane. I too have recently discovered Dukkah and I LOVE it! Thanks for sharing, Jane. GREAT job! Perfect for us right now! (and everyone else! )Pinning this now. Will be a great dish for thanksgiving this year! Hi Angie, I’m glad to help you out with your healthy goal and this is definitely going on my Thanksgiving menu this year!! What a great idea Jane, love not only the hummus but now seriously craving some roasted pumpkin seeds! Barbara – I couldn’t stop snacking on the roasted seeds and almost didn’t have enough to photograph, LOL!! Try them with some Dukkah seasoning – amazing!! This sounds incredible! Love the twist on hummus! Thank you Liz, I love it too! 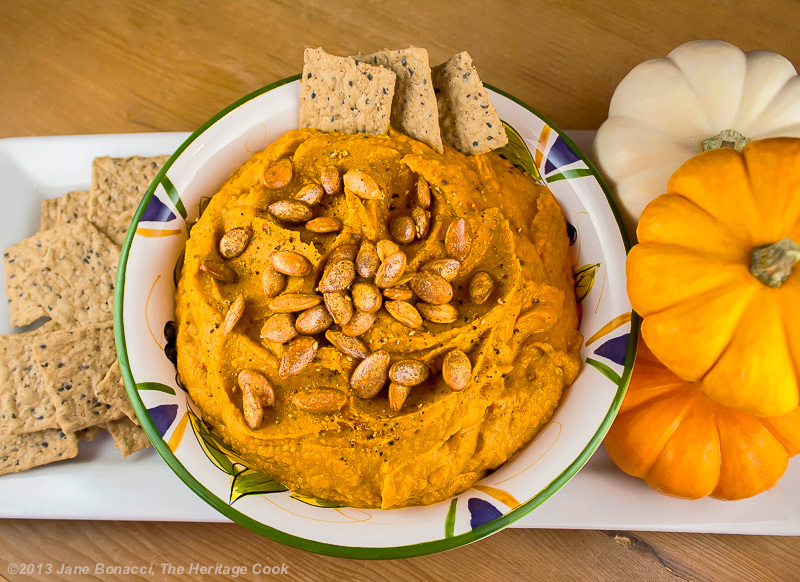 Such a fun and healthy way to incorporate pumpkin into our holiday entertaining!